When we last reported on Long Beach native Philip Pretty last year, he was still doing a bang-up job running the show over at the oft-overlooked Fundamental LA. 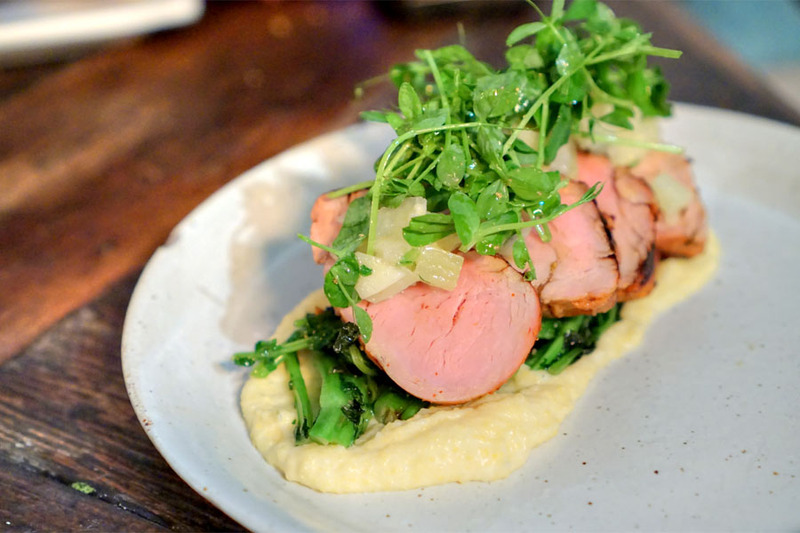 However, he ended up leaving the place in October for a spot closer to home, Restauration (a portmanteau of restaurant and restoration), replacing opening chef Erick Simmons. 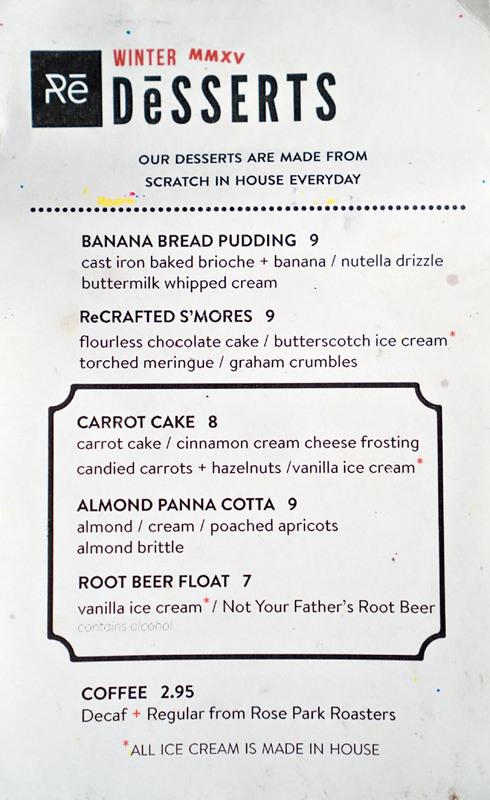 The eatery is an all-day affair, started in July 2014 by Dana and Rob Robertson, and with Pretty at the helm now, the thought is that the menu's going to be a little more venturesome. The restaurant sits on a stretch of 4th Street called Retro Row, at the address once home to 212 (Patio) Bistro, Hotspot Cafe, and Porch Cafe. The actual structure occupies a mere 1,000-square-feet or so, and holds a cozy dining room out front. However, the real action is in the 50-seater back patio, replete with its wood-fired oven and vertical gardens. 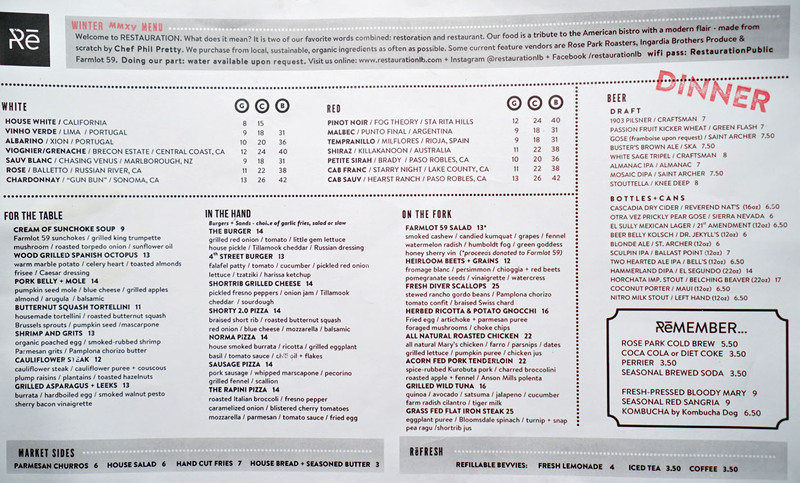 As for Restauration's dinner menu, it's divvied up into sections for starters, more casual pizza/burger type offerings, and larger, fancier mains that are perhaps more in line with what we're used to from the Chef. 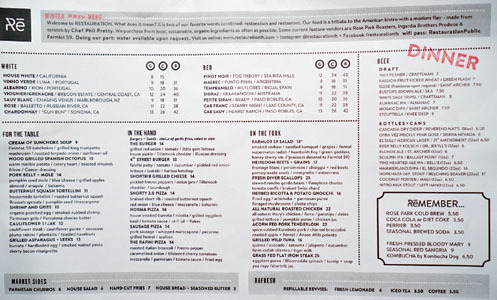 Drink-wise, we have eight beers on tap and some more in bottles, as well as a compact wine list of about a dozen selections. Corkage, meanwhile, is $10, though the organizer of the dinner was able to get it waived (we made sure to share with the servers and the Chef). Click for a larger version. Given that we'd hit the eastside of the LBC, I wanted to start local, thus the 2015 Beachwood Blendery Propagation Series: No. 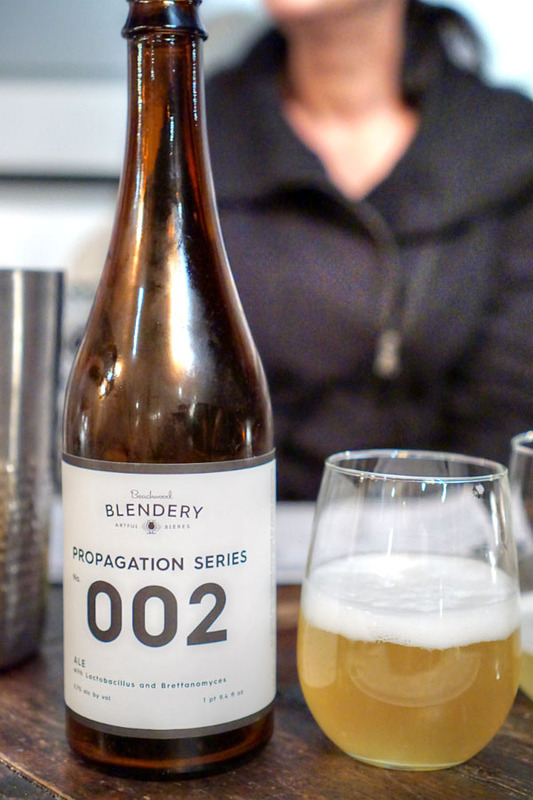 002, a Berliner weisse brewed with Lactobacillus and Brettanomyces that was part of the brewery's first release back in November. I'd tasted the beer on draft back then, but will say that it's better from the bottle. 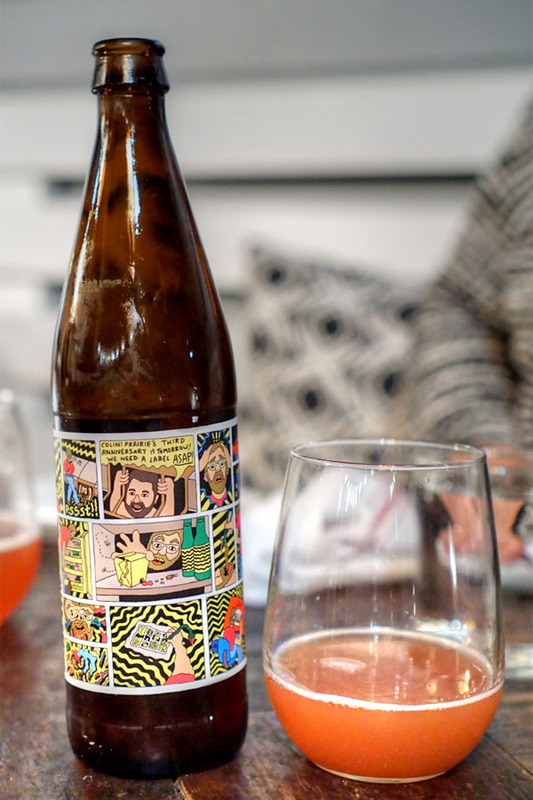 I got a good amount of juicy stone fruit and tart, lactic character on the nose, while the palate conveyed a puckering quality and more sweet fruit, but with a finish that went decidedly dry. I have a hard time saying no to shrimp 'n' grits, and this was a prime example of the dish. 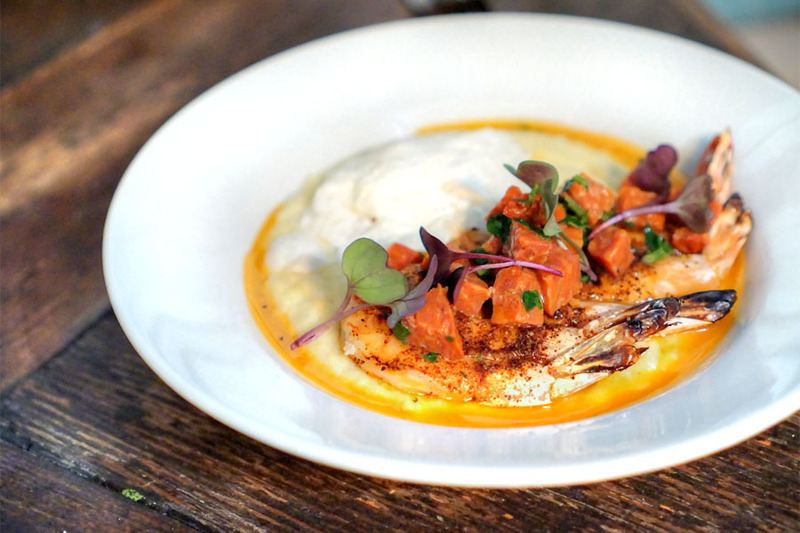 The actual shrimp arrived at a nice temperature, and showed off a brine that meshed well with the savory-spice of the chorizo, all while cheesy grits helped moderate everything. 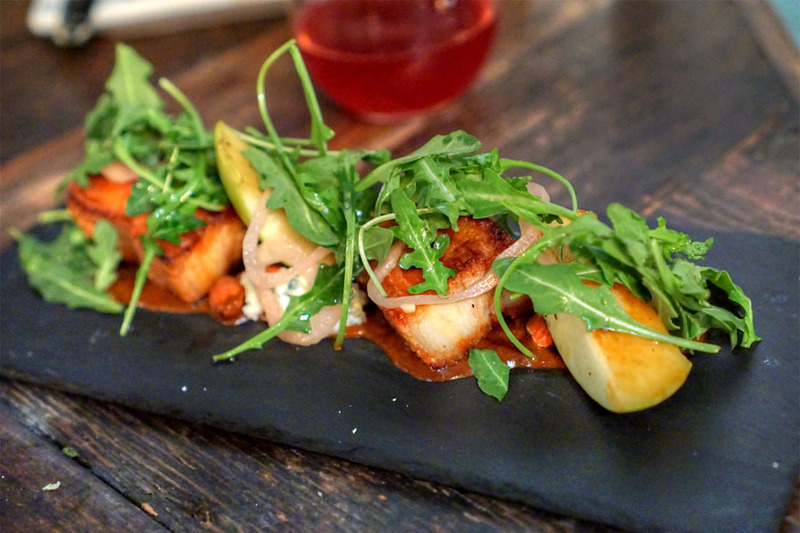 Pork belly was as flavorful and as fatty as you'd want, with a delightfully crisp crust to boot. The crux here though was that mole, a stellar complement to the meat with its wonderfully deep, sweet, spicy, nutty flavors. Arugula, meanwhile, added some countering zestiness to the mix, though I didn't really need the blue cheese. 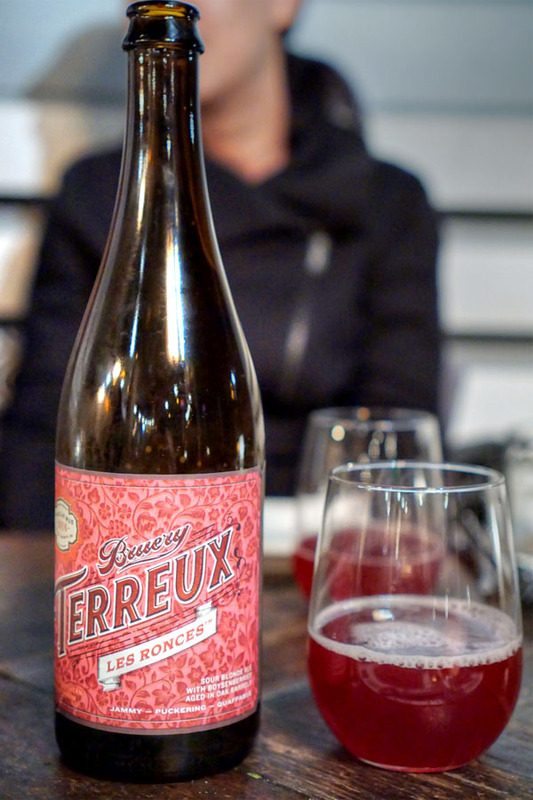 One of the brewery's first releases of the year, the 2016 Bruery Terreux Les Ronces was a sour blonde, aged in oak with boysenberries. I really liked the beer, finding aromas of acidic, puckering, yet jammy fruit. Taste-wise, I got tartness at first, with more berry on the mid-palate joined by nuances of herb and spice, while the finish displayed an almost candied, "fruit gummy snack" quality. 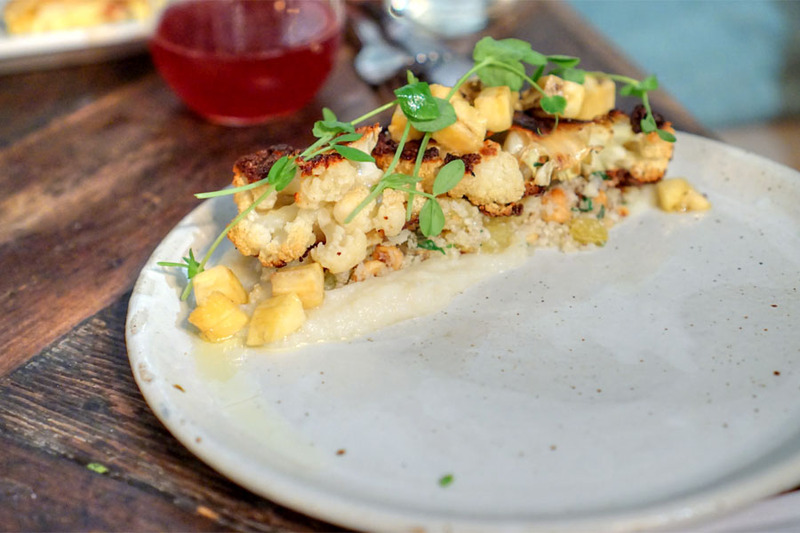 Cauliflower made a strong statement with its abundance of vegetal, charred flavors. What surprised me most though was how well-integrated the fruit was, with the raisins and plantains giving just the right amount of juicy sweetness, accented by a touch of hazelnut. 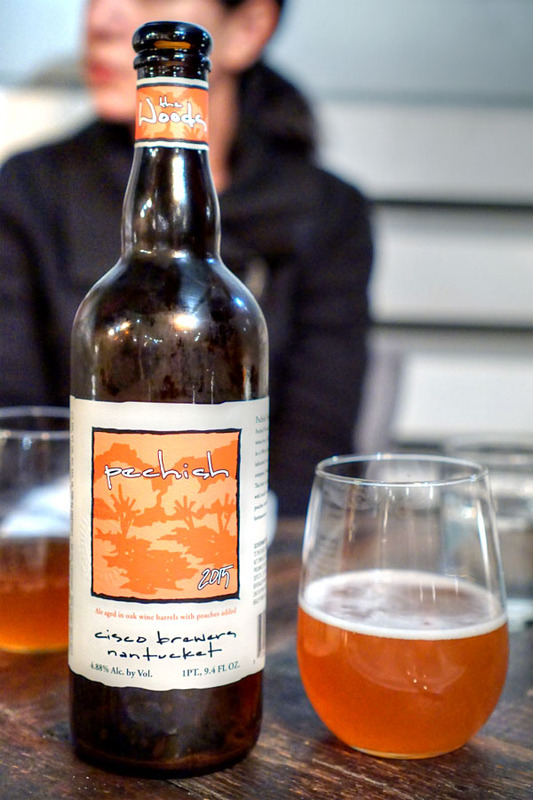 Our lone East Coast brew of the night, the 2015 Cisco Pechish Woods was a Lactobacillus- and Brettanomyces-fermented sour wheat ale, aged in oak wine casks with peaches for 18 months. Think barnyard-y, tart, and dry to the smell, with hints of stone fruit. On the palate: acidic and earthy, with subtle peach and a distinct woodiness to it. 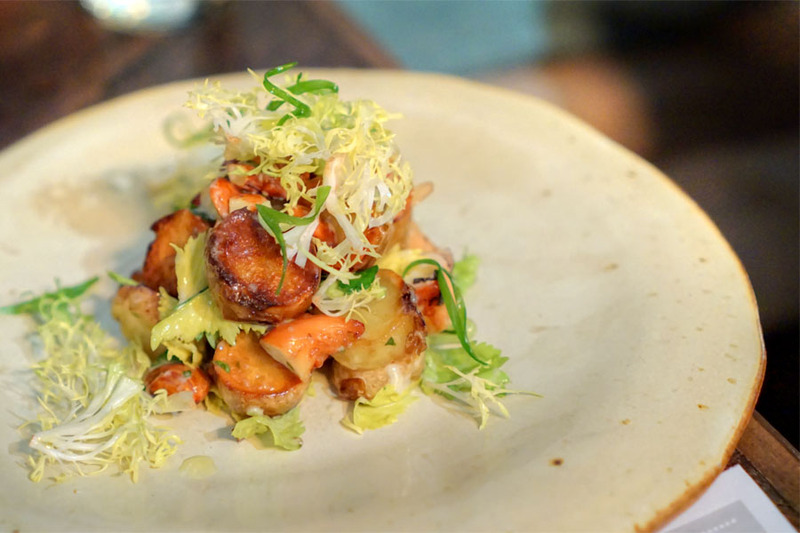 The octopus was winner, coming out nicely charred, snappy, and ocean-y to the taste. It was delish alone, but the potatoes worked beautifully as a counterpoint, and I appreciated the nuttiness from the almonds too. 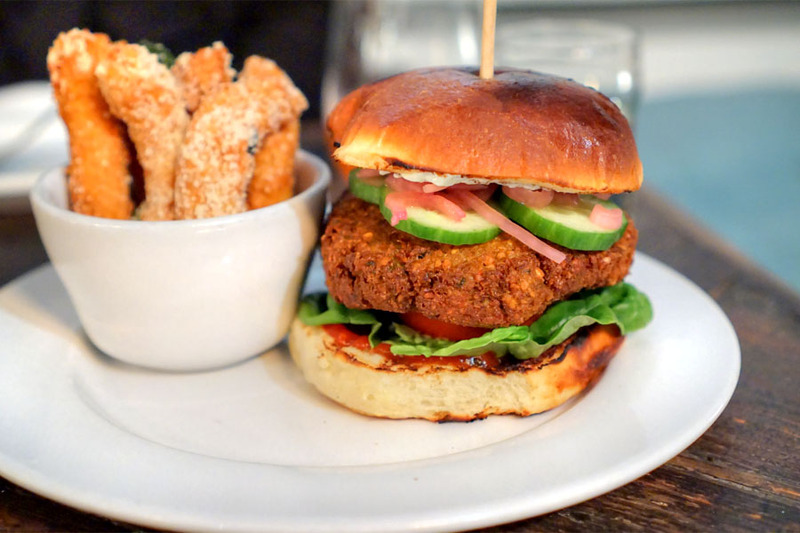 The burger was tasty, with the falafel arriving properly moist, herby, nutty. I didn't mind eating the patty just by itself, but its bright, tangy accompaniments certainly completed the experience. 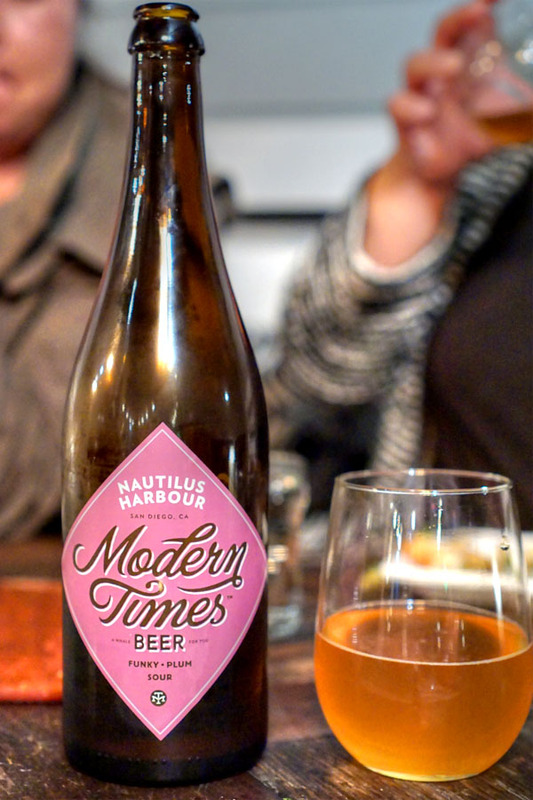 Continuing on with the sour theme, the 2015 Modern Times Nautilus Harbour was an heirloom plum-enhanced white wine barrel-aged sour saison, refermented with Brett, Lacto, and Pedio. Strong funk and lighter notes of stone fruit on the bouquet. The taste brought loads of tart, barnyard-y flavors, underscored by a consistent element of candied-yet earthy plum in the background. This particular pizza came recommended by our server, and she was right on the money. 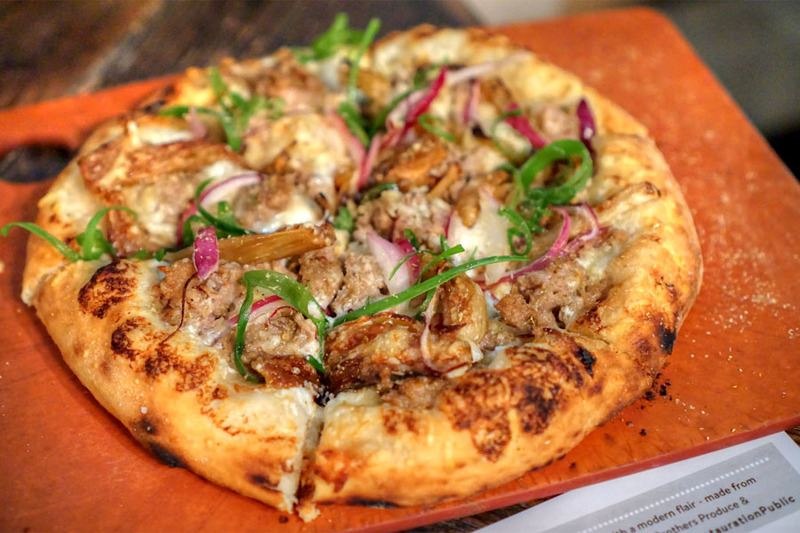 The sausage delivered just by itself, with its bevy of herby, savory flavors. I really appreciated the charring going on here as well, and the bitterness of the veggies worked out beautifully too. Tuna definitely hit the mark. I got an absolutely lovely spicing on the fish, which worked hand-in-hand with the sweet, juicy, slightly acidic flavors present as well as that nutty base of quinoa. Excellent pricks of bitterness from the greens to boot. Moving back outside of California again, the 2015 Prairie 3rd Anniversary Ale was a saison fermented on raspberries. I found this super juicy and fruity to the smell, while the taste brought strong barnyard at first sip, transitioning to raspberries and a floral character on the close. 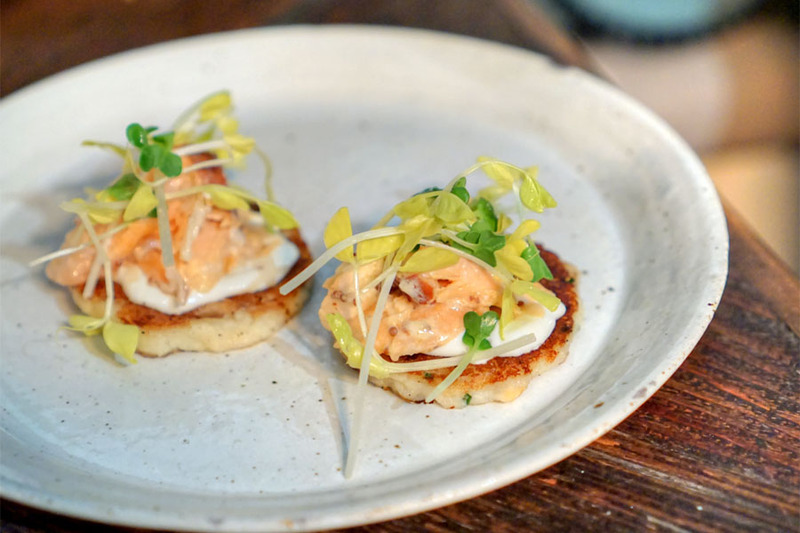 A couple of off-menu bites comprised potato pancakes topped with smoked salmon, housemade crème fraîche, and microgreens. Flavor-wise these were on point, with a great balance of smoky, fishy, and creamy nuances, evened out by the zip of the greenery. I would've liked more textural contrast though, perhaps with more crispness on the latkes or some cucumber thrown into the mix. 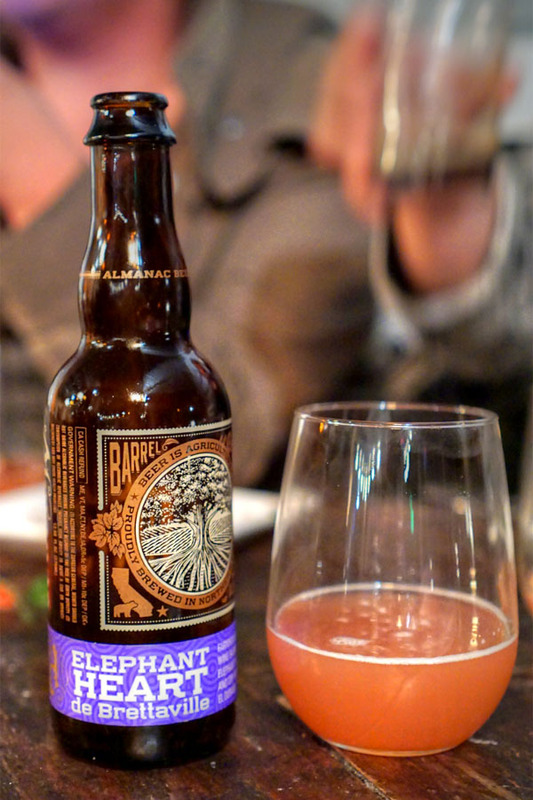 A Brett-fermented ale aged in wine barrels with Elephant Heart plums, then dry-hopped with El Dorado before bottling, the 2016 Almanac Elephant Heart de Brettaville was one of my favorites tonight. I found an excellent back-and-forth between the hops and the fruit on the nose. On the palate, the beer was hoppy initially, then gave way to rich, juicy notes of plum, with a Bretty funk overarching everything. The most substantial course of the meal was also a highlight for me. I really appreciated the deep, spicy notes imparted to the pork from the rub, and how that complemented the meat's innate savoriness. Great astringency and charring from the broccolini, and I was a fan of that polenta too. 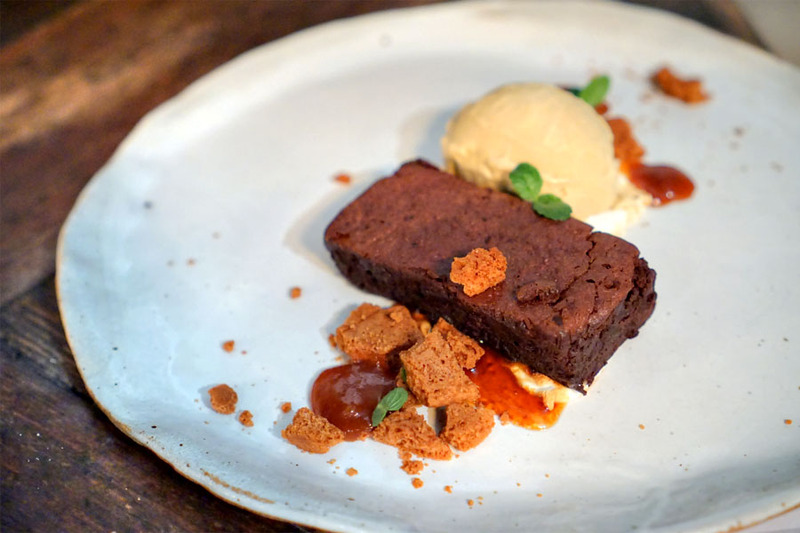 Desserts at Restauration are largely the work of Chef Pretty as well, and lean toward modern renditions of familiar tropes. Click for a larger version. A rejiggered presentation of s'mores was classic and comforting, with the unabashedly rich, dense cake making sense with the ice cream and meringue while the crumbles imparted a welcomed textural play. 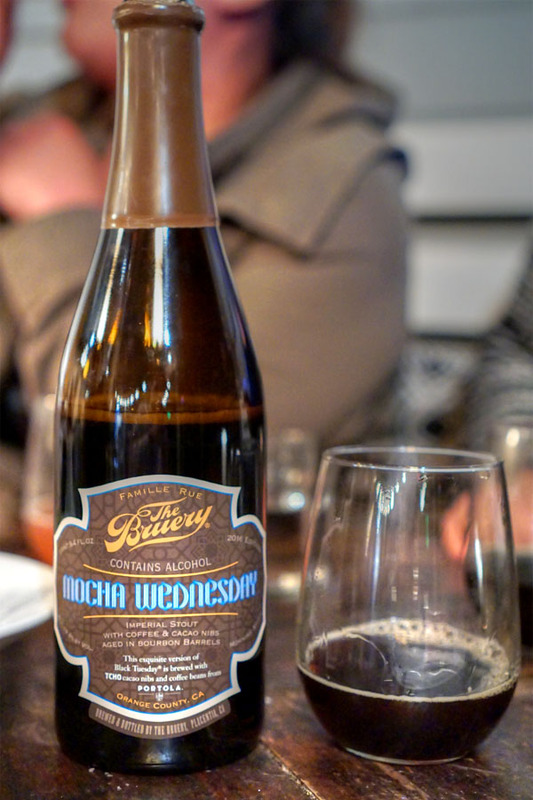 Dessert called for something heftier to drink, so we opened the 2016 The Bruery Mocha Wednesday, a bourbon barrel-aged imperial stout with TCHO cacao nibs and Portola coffee beans. It was as delicious as always, with in-your-face aromas of super roasty coffee intertwined with chocolate. On the palate I found massive amounts of coffee leading to huge flavors of chocolate and rich malt, with just a hint of booziness toward the finish. A benchmark coffee stout. 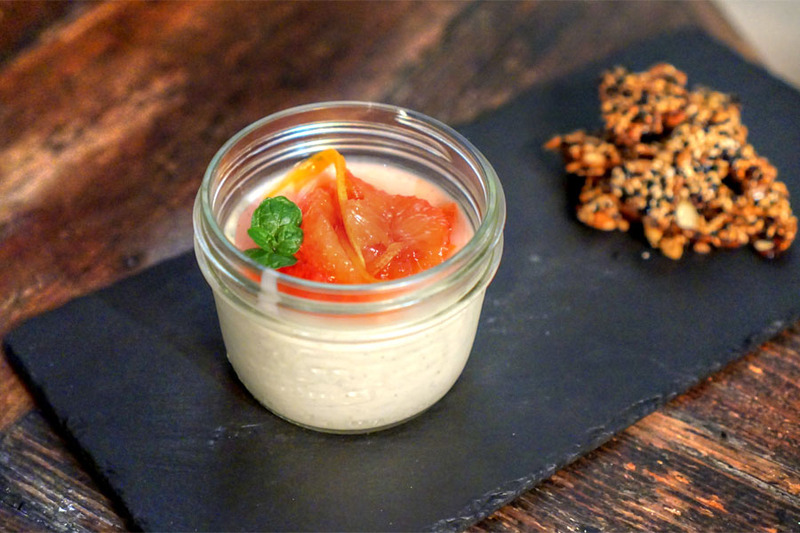 We were told that the panna cotta was replaced by a yogurt, which wasn't a bad substitution. Lots of creamy, lactic notes at play, set against sweet, spicy citrus, with the nutty, savory brittle serving as a stark but effective counterpoint. 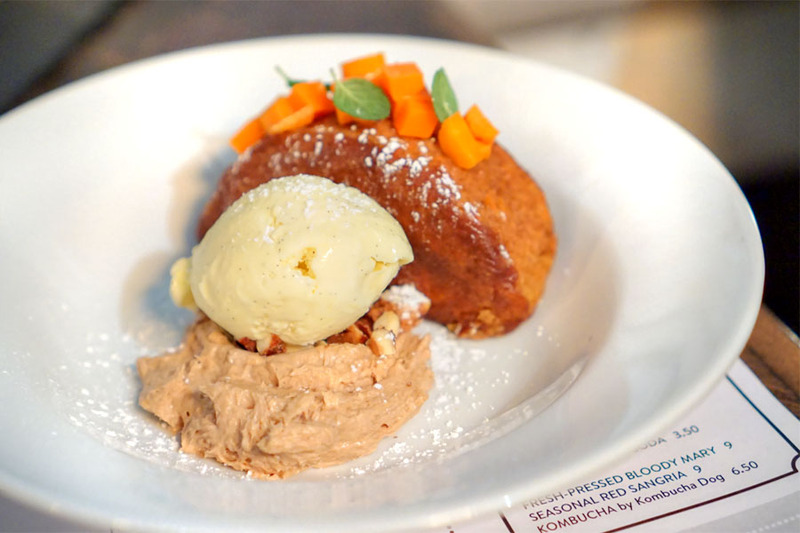 The carrot cake was my favorite of the desserts, coming out positively teeming with sweet spice and carrot goodness, the ice cream providing the necessary amount of contrast. The departure of Pretty from Fundamental was a loss for LA, but a win for Long Beach. 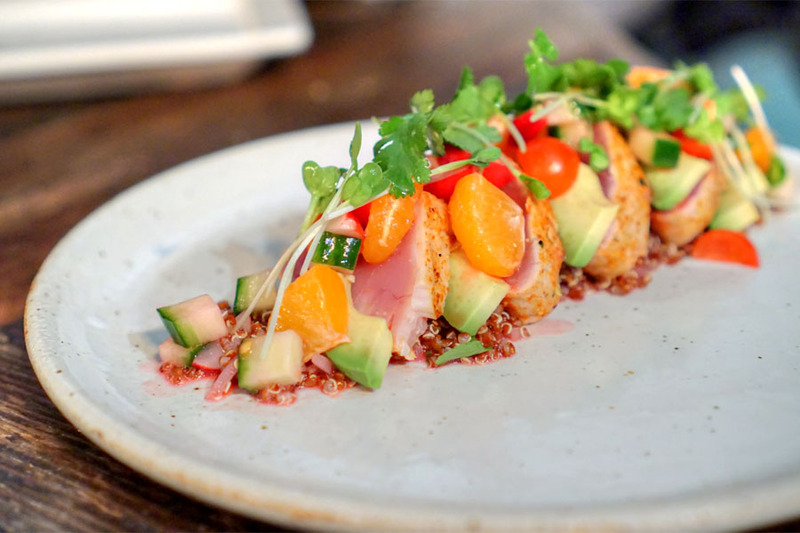 To be sure, the cooking at Restauration's certainly more casual than what the Chef was putting out up in Westwood, but that finesse, that panache is still evident in the food here. 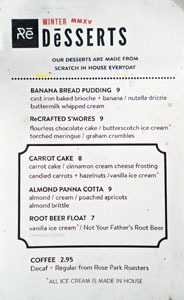 Customer response to the new menu seems to be positive as well, which is heartening, and I do hope that the kitchen keeps pushing things. Actually, word is that the team is looking to open a smaller, more intimate, more ambitious space nearby, so that'll definitely be something to keep an eye out for. Who was Exile Kiss? And what happened to him?